This degenerative process can be greatly accelerated by lifestyles that involve heavy labor or those which are extraordinarily sedentary. Genetics is also known to play a significant factor in pathological disc degeneration. Although there are different “flavors” of annular tears, radial annular tears are the most common. With normal age, the annulus (a ring of ligament fibers) tends to lose strength and pliability, which makes it more susceptible to the development of annular tears. 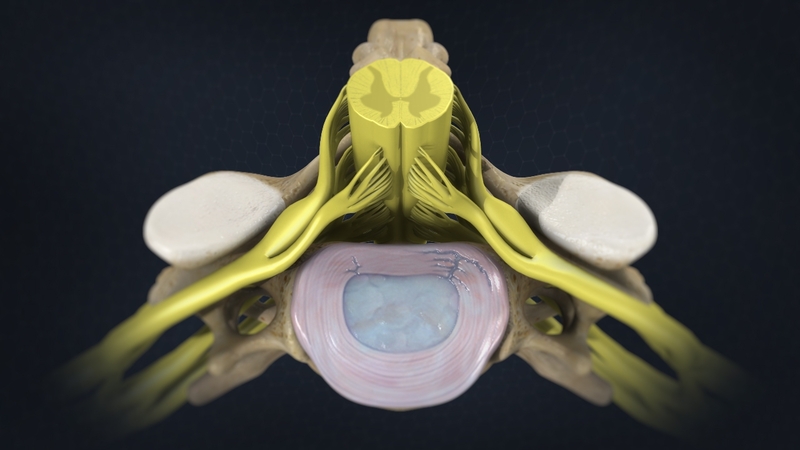 An annular tear occurs when the tough outer layer of an intervertebral disc rips or tears. An intervertebral disc is a specialized type of joint between two vertebrae. It provides support and mobility, and also acts as a shock absorber, for the spine. What causes an annular tear? With a sudden trauma – or more commonly, degeneration over time from day-to-day activities – an annular tear can occur. An annular tear often irritates and exposes the nerves of the intevertebral disc, which subsequently produces a great deal of pain. Are all annular tears the same? Annular tears can be categorized as radial, peripheral or concentric. Radial tears begin at the center of the disc and extend through the disc to its outer layers. Radial tears are most frequently degenerative, or a natural part of the aging process. Peripheral tears occur in the outer layers of the disc and concentric tears occur between the layers of the disc. Both peripheral and concentric tears are usually the repercussion of a trauma or injury. Annular tears may go unnoticed in some patients who do not experience any symptoms. However, the majority of patients experience pain, frequently in the neck or back, which can be severe. Depending on the location of the affected disc, pain or numbness may travel to other parts of the body, including the hands or feet. In addition to a physical examination, doctors typically perform one or more imaging tests to diagnose an annular tear. An intevertebral disc – and injury to the disc associated with an annular tear – can be visualized most readily with a CT scan. An MRI may also be used to diagnose tears. How is an annular tear treated? For many patients, annular tears are successfully treated with a variety of conservative approaches, including hot or cold compresses, physical therapy, and pain medications. Other treatment may include epidural injections, massage, hydrotherapy, and electrical nerve stimulation. When initial treatment is not successful, patients may benefit from surgical treatment. Surgery may also be required when an annular tear results in disc herniation, a complication that occurs when an annular tear causes a gel-like substance within the intravertebral disc’s center to seep into the area that surrounds the disc. How do you know if your neck or back pain is the result of an annular tear? Trust the professionals at the Florida Spine Institute, a multi-specialty model spine care facility – to diagnose your pain and discuss the many treatment options available today. Annular Tear (2012). Wheeless’ Textbook of Orthopaedics. Available at: http://www.wheelessonline.com/ortho/annular_tear. Last accessed December 8, 2014. Windsor RE, et al. Cervical Disc Injuries (2012). Medscape. Available at: http://emedicine.medscape.com/article/93635-overview. Last accessed December 8, 2014.